As with any great product, there is more than one person who claims to have invented soft serve ice cream. One story claims that a man who was delivering ice cream had his truck break down. Not being able to fix his truck right away, he set up shop alongside the road and sold the ice cream that had begun to soften. It was a hit, so back at his shop, he kept melting it and selling it from that point on. There’s seldom a much more desired treat than soft serve ice cream and frozen yogurt. Simply put, it is delicious and satisfying. With the nation craze of frozen yogurt chains, it is as easy as a pull of a lever! While everyone seems to love ice cream, there’s no better way to have it than a waffle or sugar cone filled with soft serve. Here are our Top 5 Reasons Soft Serve Ice Cream is Better than Traditional Ice Cream. With soft serve, there’s no cleanup other than licking your fingers….. It’s easy to top off a cone and eat it from top to bottom with zero waste. Although you can certainly have soft serve in a bowl, there’s nothing better than being able to eat it along with the container. Unlike traditional scoops of ice cream, the soft-serve and cone become one with another. Don’t like the mess, just dip in in a hard candy shell and dig in. Most people think of soft serve ice cream as a treat. Yes, because it is delicious. Looking past the obvious, it is something that you cannot keep it in your refrigerator at home like traditional ice cream. It’s something special you can only get by going, making it even more desirable. If soft serve was available at home, it would still be awesome, but probably lose some of its magic. Unlike hard ice cream, you can easily mix in just about any ingredient you like which becomes immersed in the ice cream. From sprinkles to fruit to candy, anything can be added with just the swirl of a spoon. Soft serve ice cream is the best way to turn ice cream into a mega-dessert for just about anyone. Soft-serve is on-demand which means it is always fresh. The soft-serve ice cream machines keep the product at perfect holding temperatures without exposure to the air making each service as fresh as the last. It is all to common to have ice crystals mixed in with traditional ice cream even after just a few hours since it melts and refreezes as it is exposed to the air each time scoops are removed. In order to make soft serve, air is pumped into it to make it lighter and fluffier. Ounce for ounce, this air mixture makes it less caloric than traditional and denser ice cream. We will not make the claim that it is healthy to eat soft-serve, but can make an argument that it is healthier than traditional ice cream. However, most soft-serve these days are also served as yogurt or some fat-free alternative which are less fat than ice cream. 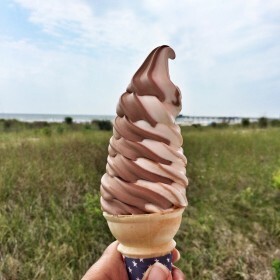 As with any food, it all depends on the ingredients and quantity of what you are eating, but if you are comparing soft serve and hard ice cream, overall, soft serve wins the battle of the bulge.